Brownie's Tankfill is unique in its ability to draw upon internal resources to produce welded stainless steel or aluminum tank racks to meet any shape, size or capacity. Skilled metal workers, welders, designers, and installation experts come together to perfect the unique challenges of securing high pressure tanks when off the shelf systems found in our retail superstore will not suffice. Imagination is the only limitation to the potential of stowing dive gear. Polypropylene dive tank brackets, scuba tank handles, fishing rod holders and much more. Roll Control systems offer a wide variety of solutions for boaters. Roll Control provides heavy duty aluminum track to hold scuba tank brackets or fishing rod holders, and a variety of mounting kits to allow custom installations. Brownies Third Lung offers sales of these systems, the insight in to "how best to implement these solutions," as well as installations by Brownie's highly skilled staff. Built with schedule 40 PVC, with 8 inch diameter and 24 inch length; White pipe cleaned and with finished edges. Custom lengths are available. 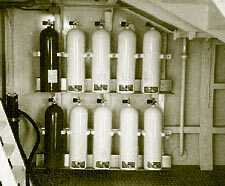 Brownies builds these racks with stainless steel or aluminum frames, for any configuration of tank storing. Perfect for horizonatal or vertical mounting, Brownie's Tank Racks are custom made for your application! Contact Us for Roll Control System products. 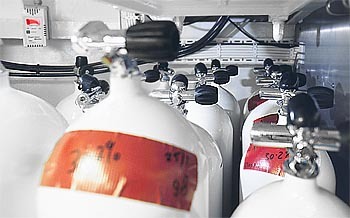 Durable polypropylene adjustable tank brackets (two-piece) slide into aluminum or molded track to safely transport tanks vertically to your dive destination and fold down flat when not in use. Fits all size tanks. (Not for use with tank handles.) Sold in sets of two. Start with the heavy-duty 48" x 1-7/8" anodized aluminum track to custom design your accessory system. Mounts to any surface—boat transoms, gunnels, vans, and truck beds. May be cut to any length. One track holds up to five tank brackets (four, if end caps are installed). Holds standard and adjustable brackets, rod holders, accessory mount, rope cleat and drink holder. 11-1/2" x 3" molded plastic track features modern design with no sharp edges. Holds one standard or adjustable tank bracket or two accessories: drink holder, rope cleat, rod holder or accessory mount. The perfect add-on for boats, personal watercraft and jet boats! Heavy-duty one-piece injection molded rod holders lock into mounted aluminum or molded track and provide multiple rod holders for trolling or convenient on-board storage. Straight or 30° port or starboard angles available. Made of tough PVC plastic, two end caps protect and finish the ends of mounted aluminum tracks and double as an adjustable positive stop for tank brackets mounted in trucks and vans. Stainless steel hardware included. Contact Us for Roll Control System products.